Gosh, I look at our girl and think "Wow, she has come so far!" I remember, as if it was yesterday (and it's been three months), the day I brought her home and she wouldn't get out of the car. I sat with her for an hour talking to her, petting her head, offering water and snacks... and nothing. I thought "What did I do? What if she hates me?" I remember carrying her in the house and placing her on her bed and she didn't budge, not a muscle. I remember laying on the floor with her for hours on end just petting her and loving her and whispering what a pretty sweet girl she is. I remember carrying her outside 3 or 4 times a day because she was afraid of everything and she wouldn't even stand.....forget about walking - standing was more than she could handle. And I remember begging her to eat and telling her it was ok. I told her that no one would hurt her and she was home forever. I remember we called her "Sack of Potatoes" for the first three weeks because she never stood....not once! And then we called her "She's got legs!" because she finally realized standing isn't so bad....and steps....she's mastered them beautifully. I remember those first nights tiptoeing down the stairs and laying with her in the darkness and petting her pretty head. 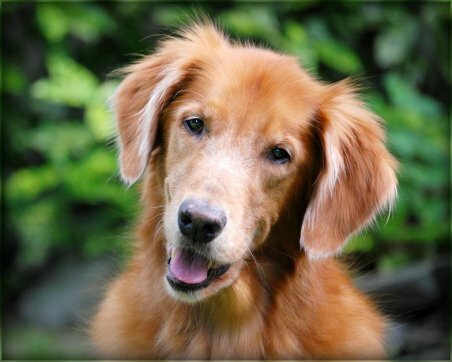 I whispered to my old girl, Millie, my sweet golden who had a heart of gold...I would whisper "Millie, come tell Belle that it will be ok, that she can trust us, that we love her and she is safe." She has learned that if she sits next to someone, they will pet her. And people who come in the house are our friends. She has learned to brave the wind from the old golden next door, Morgan, who passed away last week. And Brave Belle has learned that when I say, "It's alright" that it really is ALL RIGHT. She has learned that when I say "There's Luke!" to jump up and look for Luke and she has learned to go to the back door when she wants to go out. Brave Belle has come such a long way in such a short time. She is not the "champion perfect golden" as her ears are too short and her tail is curly and she has a funny "mane" like a lion! Her legs are bowed (but I swear over time they are getting straighter!) and her ears need constant cleaning and care. She still has bad breath although that is improving too and she tells me that rescues don't need to "sit" on command. LOL She has funny hair that grows between her toes and her lip gets hung up on her crooked teeth and it makes her look like she's snarling. Oh no, our Belle is not the perfect golden by anyone's perfect standard....but by our standard she's perfect for us! I can not tell you how much joy she has brought us. She still stops at every new flower and every new branch and smells it. She is joy, simply a sweet lovely wonderful brave soul who we are so lucky to love. Photos....well, as you can see, she never sits still outside and is after the stick, the ball, the bottle, the bird, the squirrel, was that a groundhog I just saw out of the corner of my eye? Love to you all and hugs to Jack. Make sure you let me know how he makes out with his MRI. Nancy, your update brought us to tears. Saving dogs like Belle from unfortunate circumstances is why we all do what we do. And we thank you for having the patience and the compassion to help her learn how wonderful life can be outside the puppy mill. Gretchen is now Sadie and seems to be very happy and adjusted to her new home and family. She is an absolute delight and it would be very hard not to love her up. I really cannot believe what a good girl and such a loving dog she is. Sadie's been getting a lot of exercise, attention and love. My daughter and I are taking her to the vet on Monday. I will keep you in touch with her weigh-in. She actually does look thinner and she has more energy already. Also I've been brushing her everyday and her coat is like silk. Sadie is a beautiful golden girl. She does look like she�s lost some weight�and what a pretty face she has. She�s GOT to be feeling so much better now that she�s getting the love, attention and exercise that she needs. Thank you so much for seeing past her obesity and wanting to help her. Please accept this donation to honor Terrance Dolan in his achievement of his becoming an eagle scout. 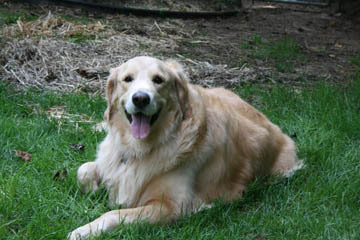 Yes, the Dolan family has a Golden Retriever named Sierra. A wonderful addition to their family! I will tell Terrance of the donation, but would appreciate someone from your organization mailing a confirmation of the donation to him. Understanding that GRRI is a non-profit organization, I have enclosed some postage to defray the cost of this and a few other pieces of correspondence. Abby, thank you so much for the donation and for the postage! We�ll certainly notify Terrance of your donation and offer our congratulations as well. We would like to thank you very much for the contribution towards Marshall's surgery. We are extremely grateful and it really shows what a noble organization GRRI is. Marshall is doing well and the pathology of the tissue around the tumor came back clean - so hopefully he's on the road to a long happy, healthy life! He's a great dog and we just LOVE him! Mary, we were so upset when we heard about the mast cell tumor. That�s great news that your vet got clear margins. We hope you have many, many happy years together. We can't imagine what we would do if something like what befell Susie were to happen to our Ben. We want to help. Please find a check for $50.00 to offset the expenses for Susie's care. Ben just loves to carry around his stuffed toys but has not swallowed them or parts thereof as of yet. Best wishes to Susie and all the wonderful people who helped. Thank you so much for your donation. Susie has fully recovered from her surgery although she hasn�t learned her lesson. She needs a 24-hour surveillance camera on her to stop her from trying to eat everything in sight! I just read with tremendous enjoyment the article in your summer newsletter entitled �I Went On Vacation.� It certainly sounds like Shiloh�s family was well prepared for a wonderful vacation that included him. There was one thing I saw in the article which I wish to comment on and which you may wish to make note of for the benefit of dog owners/lovers everywhere. Shiloh mentioned how his Nylabone� was included with his other belongings for the vacation. Being the proud owner of a Golden Retriever myself (as well as a spoiled champion Cairn Terrier), I have had many years� experience with Nylabone. However, I recently learned something very scary about them from my veterinary dental technician, scary enough that I thought I should share it with you (especially since my Golden, Indiana, loves them herself). Our dental tech strongly warned me against using regular Nylabones (the hard ones) because she and other veterinary dental personnel are seeing a steadily increasing number of serious dental injuries such as fractured and severely damaged teeth that are directly attributable to the chewing of hard Nylabones. She strongly recommends that instead we use the softer, pliable variety that are most commonly known as �gummabones� because they are far less likely to cause such dental injuries, many of which are not even treatable. I�m sharing this with you because of my strong concern for the welfare of all dogs, and I hope it may be of some benefit to all involved with GRRI-NJ. Hi Ken, point well taken, you�re absolutely right. Shiloh is allowed to have Nylabones because he has a very gentle mouth and only carries them around with him like a pacifier. Serious chewers could indeed fracture teeth on hard objects like Nylabones. Likewise, gummabones can easily be chewed up and ingested by a strong chewer. Thanks for writing and we�re glad you enjoyed Shiloh�s article! We hope you all had a fun July 4th Holiday! Thought this picture of Liberty would bring a few smiles! Here he is relaxing after a long morning walk in Monmouth Beach. 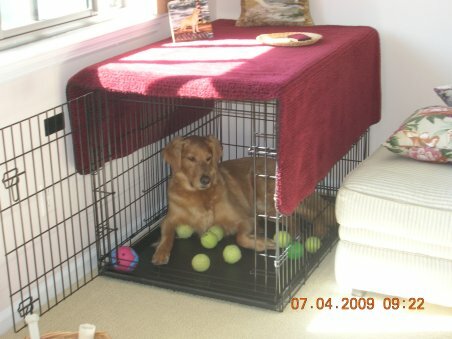 At five years old, he still loves his crate and happily wanders in & out. Everyone enjoys seeing Liberty...especially walking around with his stick! Hi Irene, thanks for the photo�he is adorable! Thank you for the pictures. More importantly, thank you for Lucky. He is a dream and has adapted seamlessly. He is getting ready this morning for his first trip to Vermont where he will have lots of space to run and play, lots of lawn to chase tennis balls, lots of woods to explore and lots of cows to meet. We couldn't be happier and are very grateful to everyone at GRRI-NJ for helping us complete our family with the addition of Lucky. We'll continue to keep you advised of Lucky's new adventures. All our best. Lucky is one VERY LUCKY little guy to have found his forever home with you. We can�t wait to hear about what it�s like to explore the world through a puppy�s eyes. His Birthday will start off bright and early with a grooming appointment. I am having Archie groomed at a facility that also has a do-it-yourself dog wash so I can do Halo at the same time :-) (It's also a Bakery so I ordered him a cake). Then home for a snack of Goat's milk yogurt and Honeydew Melon and a nap. I have to bring Halo to his last Obedience Class at night which he will hopefully get his Graduation Certificate. So I bought some new Bully Sticks for Arch to chew on while we're there. And he can spend some quality time with his Daddy. Happy Birthday, Archie. Gee, it seems like only yesterday that you came into rescue. You look fabulous! First of all, how are you and Jack and the gang? I think about you guys all the time - I talk about you! LOL Good things about you, I promise. I always mention Belle's special foster Mom and her foster family.....too good for words. We loved the stories and the letters in the newsletter about Belle. Wow.....she is so special and it is so cool to read about other rescues and about Belle's progress. It is hard to imagine that we have only had her for four months - it feels like we have had her forever. Belle came out of her shell big time. Wanna know the solution? Get a kitten! LOL Well, it isn't our kitten, but a few weeks ago my friend called me that she found a tiny little kitten eating grass in her compost pile. I said "Keep it!" and she said, "I will but we are leaving for FLorida tomorrow." Okay, sucker me, "Bring her over." She was a mess, poor little thing. My friend climbed on a plane and I climbed in the car for the vet. Broken tail, round worms, fleas, anemia, fever (the vet thought she was about 5 weeks old)......I kept her separated from Belle and after a few days on antibiotics, round worm treatment, a few baths each day and good food, she started to recover. I still kept her isolated even though all her tests came back negative for feline leukemia and HIV. Belle was dying to get near her though and nosed in whenever we gave her the opportunity. Last week my friend was off again on another trip so little Lola came back for another visit. Now she is healthy, no fleas, no worms, no infection......Belle was in her glory. Belle finally had a job! "Kitten!?!? You say you need to keep an eye on the kitten? I'll do it!" And so she did, wherever that little Lola went, so did Belle. If the kitten was under the couch, Belle was laying there watching and spying. If the kitten went into the kitchen, so did Belle. She had no fear of scary cabinets or doors that creak...."I'll keep an eye on that kitten!" "Look over here! She's behind the fridge!!!" "Quick, get her, she's headed for the basement stairs!" "Oh no, she's chasing that fake mouse again...when will she learn that it's stuffed?" They really like each other ....the kitten would come and walk under Belle's legs ....in and out, meow. Belle would nuzzle her belly with her nose, the kitten would hang from her tail, they ran through the house together! The kitten went back home (which is good for me because as that kitten, as sweet as she is, gets older, she will try to eat the bird. I was constantly closing doors and letting this one come out so that one could go out.....you know the drill of switching animals in rooms so no one gets eaten (literally)!!!!! I was so busy the month of June with our little Piping Plover chick on the beach. (He has now sprouted his wings and flown off to safer place). Lyn and Joan of GRRI NJ (who did my home interview) have become volunteers on the beach for the program I run. They are awesome and they have spoiled Belle rotten. Joan made her some of her "I'm not sure what's in it ear solution" but it sure works great. So much better than the stuff from the vet. They send over bully sticks and cow esophoguses and right now she is laying in her bed chewing on a deer antler! YEP! They have spoiled her rotten. They are awesome ladies and we have spent hours talking about dogs and rescue and birds and ne night not too long ago they helped me rebuild tons of fencing on the beach that came down in a storm. I'm lucky to have met such wonderful folks. And Belle, my sweet girl, she's my buddy, my best friend. She follows me everywhere, Judy. She now lays UNDER the kitchen table (like a real golden)....I guess my tidbits of steak and chicken helped her get the idea. Now she "loves" to go under the table....especially at dinnertime, Dinner-Belle! She loves her empty water bottles in the yard and my neighbor gave her a ball that squeaks and burps and eeks when it rolls. She is fascinated with it but won't move it by herself. She is sweet and funny and smart. She has almost learned to sit (LOL) but still chooses not to leave the yard for walks (I'll stay in the backyard, thank you, where I know every blade of grass and the smell of every flower!) She is charming and everyone loves her. I am going to start taking her in the car each evening and we'll go to the lake. I want to see if I get her away from the yard if she'll just walk like she does when we go to the vet. We'll see. I am not going to push her, but I think she may do better than I expect. And remember that lousy, oily coat she had? NO MORE! I have to brush her all the time. Can't we sell golden fur?....if there was only a way to spin it into yarn! I'd be rich. And her teeth! OH, they are white - yes, white! No more green- brown yucky smuck covering her teeth. She has white teeth! Here are some photos so you can see your girl. She is no more photogenic than when you had her....LOL but I have started shooting movies of her and when I figure out how to get them on the computer, I'll send them to you so you can see her in action! Fill me in on YOU and Jack and the gang. Sounds like you've had your hands full. Next time you have to go to Garden State (which I don't wish on you) call me....it is not far from my house. I'd love to see you. Aw�how cute is that? We think Belle definitely needs a kitty of her own. My SWEET boy has been with us 8 years! It's hard to believe! We adopted Archie from GRRI-NJ. He was given up when his family was going through a divorce. His mom at the time was unable to take him to the apartment she was moving to. I came to do the evaluation as a volunteer for GRRI-NJ. After a few days I drove him half way to meet up with his foster family. So yeah, I got attached to him just having him in my car for a little while :-) LOL I called the foster family to find out how he was doing with them and their other Goldens and they said he was as sweet as pie. I then went to go visit him with Angelo, and needless to say here we are 8 years later! Archie has the nicest and most even temperament of any dog I have ever seen. I wish I could clone it! He doesn't stress about ANYTHING EVER. He gets along with all animals and people. His favorite thing to do is sleep:-) He is the classic couch potato. His other favorite thing to do is eat :-) He has trained his daddy to give him a small taste of his waffle every morning. Most of the times he doesn't even have to get up, it is brought right to him! What a life! He and Angelo were so cute together and he really was a great little brother to him. In the beginning of this year, he lost his brother and best friend. He did not appear to show any grief as I think he knew Angelo was in a better place. After several weeks he became a brother again. This time a BIG brother...and he is doing such a great job! His little brother Halo has kept him on his toes, especially during the "shark teeth" phase. But now that several months have gone by, they are really growing closer and closer and have a great time playing and cuddling together. Archie turned 11 last month, and is still doing considerably well. Halo is definitely helping to keep him young and off the couch more! Archie has ALWAYS made me laugh and always will, my sweet boy. I am so glad he is in our lives! Thank you for being the best brother ever and the sweetest boy anyone could ever ask for. Although he hates having his photograph taken, I took advantage of a moment in the yard when he heard his daddy's car pull up so you can see what a handsome boy he still is all these years later. The Meaghers and Rusty won't be able to attend the reunion this year. We had to have Rusty put to sleep on Thursday, Aug. 6. He had pulled up lame, apparently from a stroke affecting the spinal cord. He had turned 13 on July 2, so he had a long and happy life; with us. We adopted him from Rescue nine years earlier, and he gave us much joy. We�re sorry you won�t be joining us at the reunion this year. Our sincere condolences to you both. Unfortunately we're unable to attend on Sept 20. Wish we could! 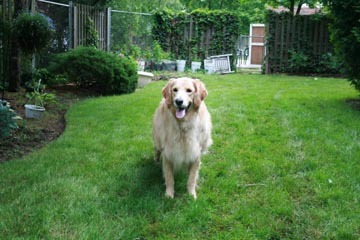 Our Golden delight, Abby, is amazing and has filled out home with love, licks and lots of laughter. At age 2, she still has loads of puppy in her and has a fondness for stealing shoes (especially Crocs) and storing them in her favorite hiding places. She's a wonderful companion, running partner and baseball outfielder. While we can't join you at the reunion, please accept this gift as our added thanks for bringing Abby into our home. Hi Christa, thank you so much for your donation! We always love to hear how well our dogs are doing with their new families. Abby D is an adorable little girl � thanks so much for the photo! Just wanted to send a recent pic of Sadie... She now weighs 121!!!! Sadie is an absolute delight with endless love. Sadie's coat is shiny and silky, she loves being brushed even her tail. You cannot believe all the energy she has. My family and I are very lucky. Congratulations Gretchen! Sounds like the diet your mom has you on is working. We can�t wait to see you at our reunion on September 20. As soon as we get our picture center working I will send pics. I tried to text you pics but they never go through for some reason. Coby is doing good (love his little grunts). He is such a snuggler. We took him to the beach. He was so funny! 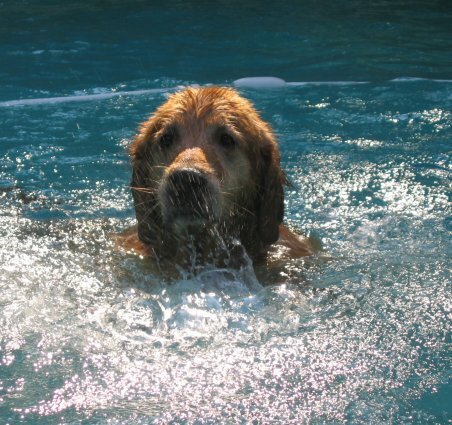 I was throwing shells in the water and he was actually diving under to find them; he�s very persistent. He was rolling all over the sand He and Clyde are doing pretty good, they did get in a scuffle. I think they are still fighting for top notch, but overall are good together. I think Clyde is still a little jealous but I think he�ll get over it. Today I let the dogs out and when they came in Coby went up to our bedroom. I thought he had the ball in his mouth but when I got closer he had picked up a pear that had fallen from our pear tree (such a little piggy). Hope all is well with Cody. Coby looks SOOO happy. What a wonderful life he has now - so much better than that awful pen that he was confined to for the first five years of his life. Thank you so much for the pictures. 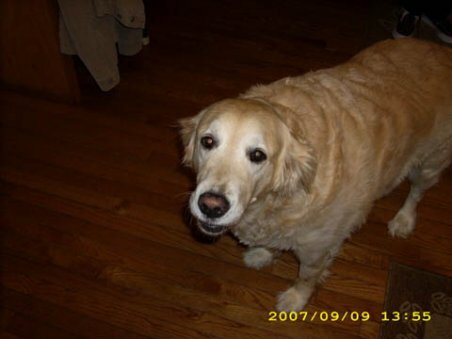 In September 2001 Labor day we adopted Maggie from your group. She was in a foster home in Belmar. She came to live with her adopted brother Kody and the relationship with her and her soul mate Kody was nothing short of magnificent. 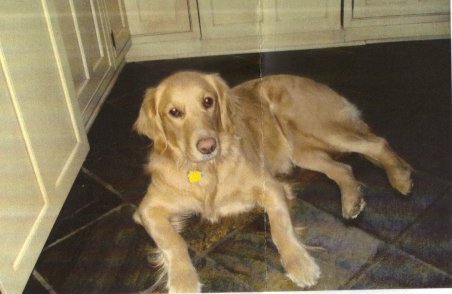 She was the sweetness Golden we ever had and we have had four to date. Maggie slipped away from us yesterday of cancer we really didn't know her exact age. She was somewhere around 10-11. I can't tell you what she met to us. Our first and certainly will not be the last female Golden. She was the love of our life. We will always remember her sweet disposition and those big brown eyes. I am happy to report to you that she led a beautiful life and had everything a dog could possibly want. She slept every night on our bed and was a life companion to my father who is 85. Life will go on without Maggie Shinkle but it will never be the same. Thank you for bringing her to us. Rest assure we did everything in our power to save her but in the end God wanted a sweetheart Golden for his night time companion. Kim and Lewis, thank you for giving Maggie such a wonderful life. We agree, life is never the same after losing a wonderful companion. Here is the check again in memory of our precious Carli � 5 years � 8/5/04. 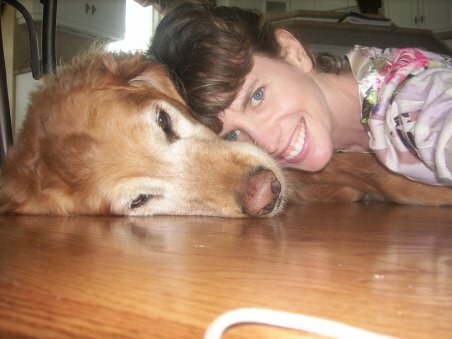 She was such a wonderful golden and I still miss her warm hugs. So glad you and Drew adopted Susie! 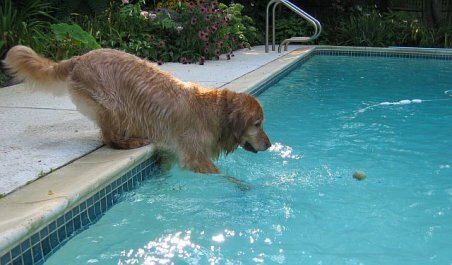 You must be very busy with all your goldens! Thank you for all your efforts for our wonderful, loving golden breed. PS � Liberty is doing just great�we love him so much! Hi Irene, Susie says she�s really sorry she chewed up your donation check. She has kept us very busy over the past 6 months; thankfully she�s starting to overcome her intense fear of men and is becoming the happy Golden that she�s supposed to be. How are you and your family and your other 4 legged family members? How many new dogs do you have? To update you a little bit, Maxx is doing fine. He is very happy now and the fights and competition with Lucy have stopped. Maxx is about 90 pounds. A little heavy we know but he is on a strict diet and a daily exercise schedule now. Lucy and he get along fine. I have not had him in the water this year. Keep up the good work with GRRI. Thanks so much for the update. Glad to hear the tension between Maxx and Lucy has ended. We agree, 90 pounds is definitely too heavy for a Golden. We hope his dieting and exercise program will turn him back into a svelte boy! 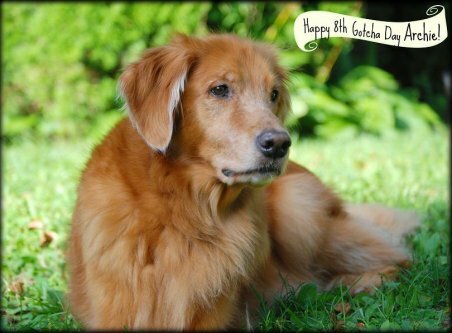 Please accept this $100 donation on behalf of Doc, my beautiful, loving 9-year-old (he turned 9 on September 8th) Golden Retriever who I adopted from your wonderful organization in 2002. Happy Birthday Doc! May you and your mom have many more wonderful years together. Thank you so much for your donation, Paula. Thank you so much for your thoughtful message; it really meant a lot. Attached please find fone of our favorite photos of Merlin. Merlin brought so much joy to our lives. We can't even begin to describe how lonely our home and hearts feel without him. Merlin died from an aggressive form of osteocarcoma. If love could have saved him, he'd still be with us today. We were sorry to hear of Merlin's passing. Our time with these wonderful animals is never long enough. We can see from the enclosed photo that Merlin was indeed a beloved member of your family and well loved. When you are ready, we'd love to help you find a new furry companion to love.